On your first visit to our practice, the chiropractic assistant will prepare a patient file containing your personal and medical details (please do not forget to fill out the in-take form we send and bring it with you on your first visit). This is followed by the initial consultation with the chiropractor. He will inquire about your health complaints and take a complete medical history. He will the perform an extensive physical examination, during which specialized chiropractic, neurological and orthopedic tests will take place, that are related to your condition. In certain cases, a radiological exam wil be necessary. If this is the case, you will be refered to one of the local hospitals. Patients with chronic conditions often already had X-rays or MRI’s taken. If indicated, we can request these studies on CD-ROM, in order to evaluate them for treatment . 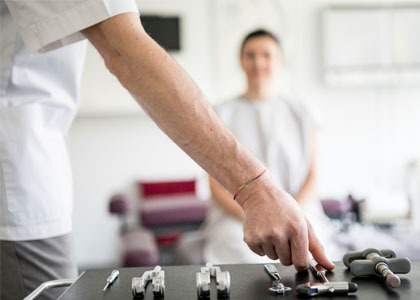 Once the chiropractor has established an accurate diagnosis, he will share the findings with you and suggest a treatment plan tailored to your specific needs. Should your condition require further examination or need a different form of treatment, the chiropractor will make the appropriate referral to another heath care professional or general (medical) practitioner. We have a special intake-form for babies and todlers. Kindly download, print and fill out the following form for your child. You can bring it with you on your first visit. After the initial examination and report of findings, we will discuss a treatment plan with you and the three phases of care. First phase of care: During this phase, what we will try to do is give you relief and make you feel better. Depending on your age, condition, and lifestyle, repeated office visits over a couple of weeks may be needed to reduce or eliminate your symptoms. Once this treatment regime has been completed a re-examination will be performed to objectively evaluate your progress. Second phase of care: Muscle and other soft tissue damage are often still there, after your original symptoms have improved. This phase of corrective care will stabilize the improvement achieved and promote more long-term healing. Visit frequency will be reduced and you will be encouraged to supplement your care with exercises or other self-care procedures. With your ache and pain gone, more complete healing can occur. Stopping care now may risk a relapse. Third phase of care: You have now reached maximum improvement and periodic chiropractic “check-ups” will be recommended. These wellness visits can detect and help correct new problems before they become serious. Many health-conscious adults choose this type of care for themselves and their children. Like other preventative measures, being ahead of relapses and choosing wellness care can save time and money by helping you stay well.